Wow! 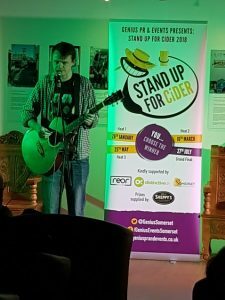 What a start to Stand Up For Cider 2018! We were delighted to have a huge number of acts apply to take part in the 1st Heat! My comedy partner in crime Tim O’Connor (who I could NOT do SUFC without) whittled down the applications and came up with the running order. 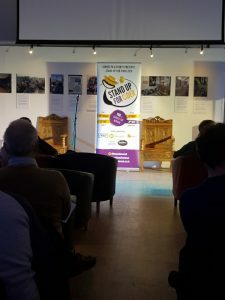 I arrived, laden down with the new Pop Up Banner for the shows – Designed by REOR Design and printed in super quick time by the team at Character Graphics. They are a huge help to me. Printing everything I need! Business Cards, Leaflets, everything! Give them a chance to quote next time you need anything? 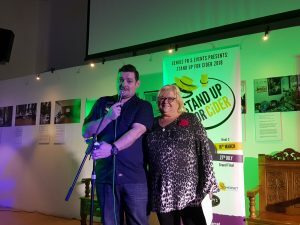 I set up the judges table with bottles of yummy cider supplied by our friends at Sheppy’s Cider – They have been supporting Stand Up For Cider since 2014 and we are very grateful. They also provide our wonderful Wassail Mug for the winner each year! 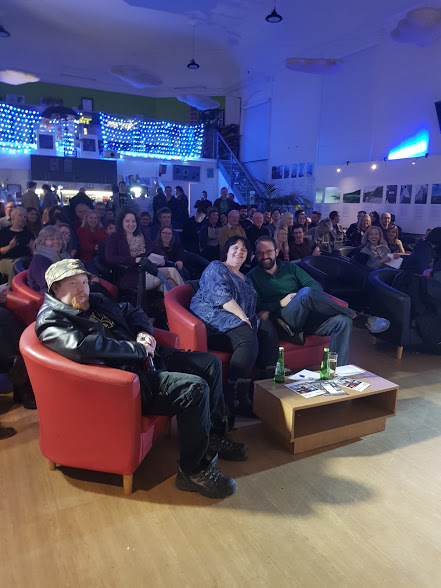 The audience started to flow into the room….joined by our contestants….the buzz was palpable…lots of smiley faces! Including our loyal friends Steve and Fiona Vellam! They rarely miss a show! 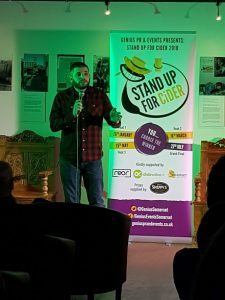 Our MC for the evening was the lovely David Arnold who was in the final of Stand Up For Cider last year! 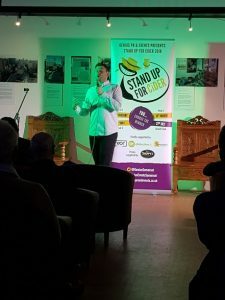 He mentioned numerous times that he hadn’t won and teased the audience…some great material from David – He can also be seen in Wellington at The Rugby Club on 9th Feb! 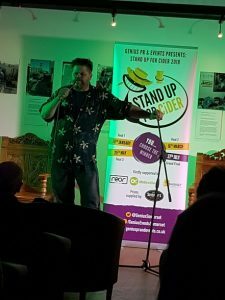 First to take the stage was Harvey Hawkins – Some strong material and very pro delivery….a great start! 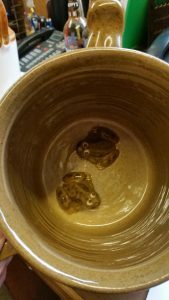 Please excuse the green in the photos…will fix the lighting for the next heat! 3rd was Gavin Pond – A big, bearded lovely fella! A bit of guitar and fab song about a Goldfish! Great audience interaction! 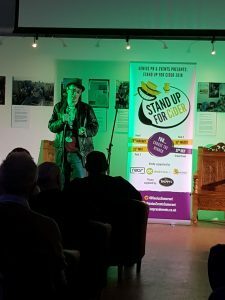 4th up was David Hoare – He bravely decided to carry out a Social Experiment and asked the whole audience to stand up….they did…and then were asked how they wiped their bums! Another bit of guitar…song about a Dog and a clever ditty about Amsterdam….Very strong candidate. Beer break where lots of cider was purchased…oh and wine, beer etc…Comedy always goes best with a little booze! 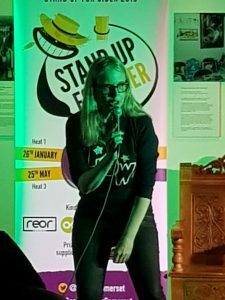 1st up after the break was our first lady – Jessie Dixon – Good material, great delivery and lots of laughs…once Martin (one of the audience members) had sorted out the mic cable! Jessie was a breath of fresh air and will continue to grow and develop I am sure. 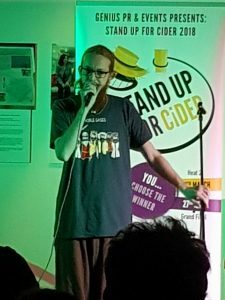 2nd up was Charlie Barnes – Charlie has Aspergers. He delivered some good lines, he had clearly been polishing his act! Very likable fella! Next up was Jon Matthews – Good, strong material with some very clever lines! Finally Jo Frank took to the stage! Dynamite performance with some quirky lines about fancying people on mobility scooters! Had the crowd in stitches! 2nd place went to Harvey Hawkins! Our winner was David Hoare! Very well deserved. 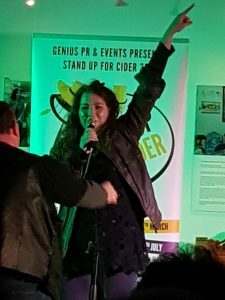 Voting was tight and some of the comments from the audience were worthy of being turned into some brilliant comedy! The next heat is on 16 March – Do book tickets quickly as we ran out of chairs last night! Our thanks to CICCIC for being an amazing venue – do check out their other shows and events. Tim O’Connor who is my comedy partner!  Distinctive UK for this website! 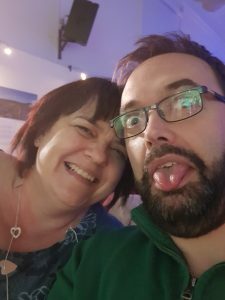 Finally, I have a website I can update and blog from easily – If you need a new website please ask Sam for a quote – He is so easy to deal with and QUICK! I love my website so much these days thanks to him! 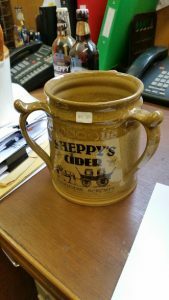 Sheppy’s Cider for their continued support and delicious cider too!